Spring Break is over, the kids are back at school and I’m finally ready to share all the fun we had! We decided to do a staycation in Winnipeg this year, plus kiddo’s birthday always falls during that week too. So, for about a month before we all started writing down our ideas on our white board. Any outings we’d want to do went on there, new places we wanted to check out, old favourites and I also crowd sourced for some online too! We ended up with a great list, that unfortunately we didn’t get to complete, but it’s perfect to keep for future outings. 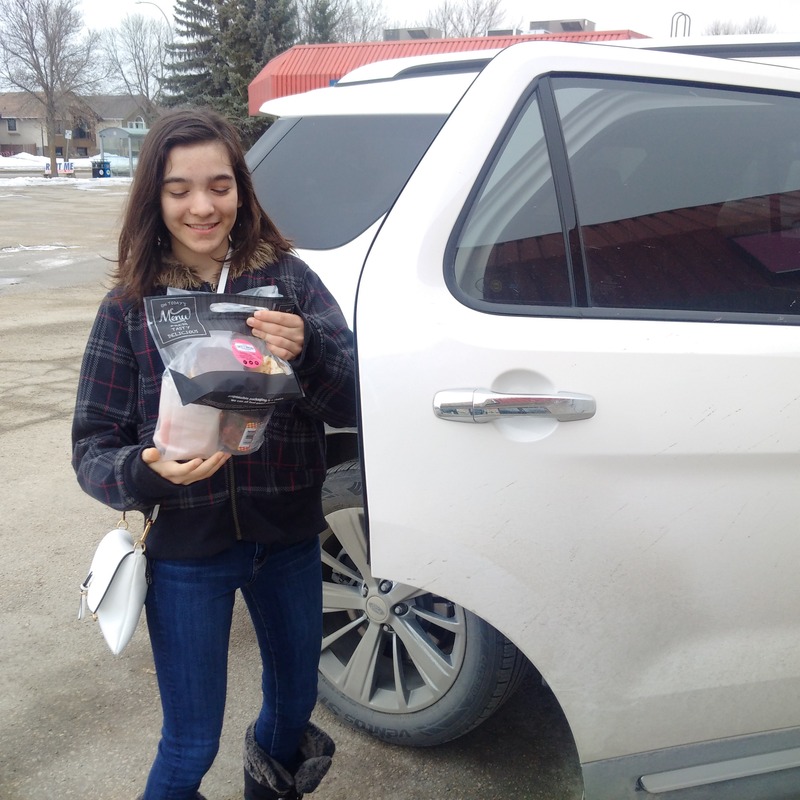 I started the fun myself while school was still in with a quick trip to Steinbach and Bothwell – picked up some cheese and pasta because kiddo had requested homemade mac and cheese for her birthday dinner. 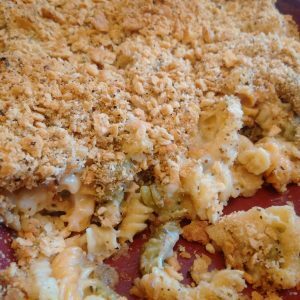 The veggie spirals from Nature’s pasta hold up well to the super thick sauce I make with tons of smoked maple cheddar cheese. 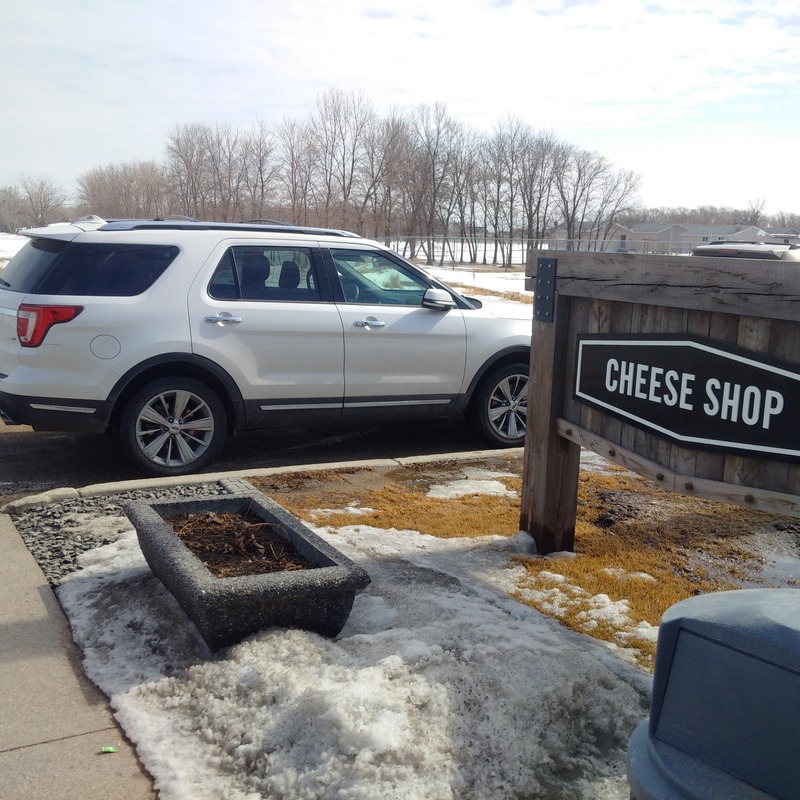 The Explorer is perfect for a stock up trip – lots of room for all the cheese and other stuff I bought, and so nice to drive on the highway! The adaptive cruise control is great, you set the speed you want and it keeps the right gap between you and the car ahead. If they slow down, you slow down. Then you get to choose to pass or not. If you drive on the highways a lot and use cruise control, this is really handy. This year we decided to start Spring Break a day early – and it was a great choice! No traffic, we zipped back and forth across the city all day long and hit up a ton of places on our list, and best of all no lineups or huge crowds! 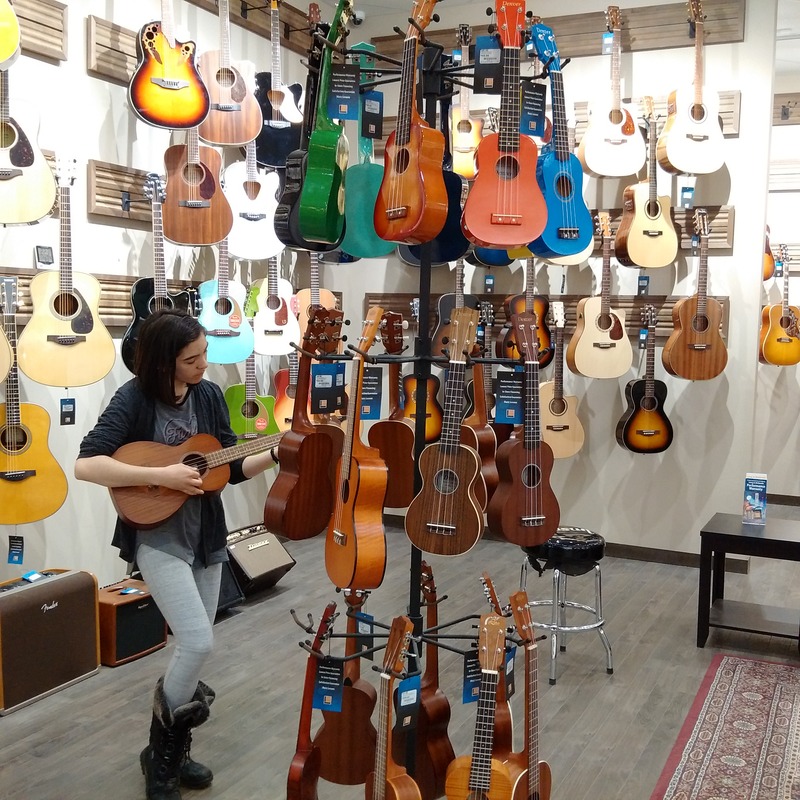 We started the day checking out all of the guitars and ukulele’s at Long & McQuade – this is one of my daughters favourite things to do. We went to both the first day, and she actually went back during the week too! They have amazing rooms at the stores where you can try them all out and see how they sound, and since she’s saving up for her next one, it was fun to go try some more expensive ones. If your kids are into music, it’s a fun place to go check out. 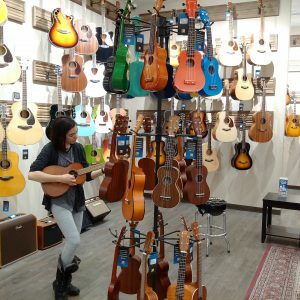 And a ukulele makes a great first instrument too – you don’t need much to go with it, can find out how to play it online and the beginner ones are really affordable – $50 gets you a good one to start with a case etc. Even if you’re not the most musical, kids can figure out how to tune it with an app, or get an inexpensive tuner at the store. Kiddo brings her ukulele with us in the car, and the acoustics in the Explorer were great so I’m including a video! 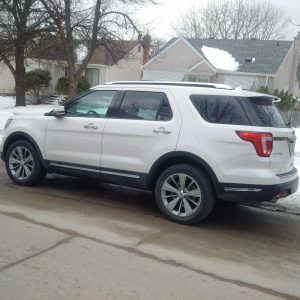 I was a bit cautious at first with such a large SUV in the city, we were all over the place and lots of parking and small spots but it really was a breeze to drive! We went to Ikea for lunch and a bit of shopping – I always love checking out the As Is section, especially when driving an Explorer! No luck this time, but I was ready in case there was a great deal on a huge piece of furniture! So much room in there. We went shopping, did errands, hit up the Italian market, Piazza De Nardi because I needed some arborio rice to make risotto in my Instant Pot. Great selection there and of course we left with all kinds of goodies and a giant chocolate easter egg for kiddo. I picked up seeds and those little greenhouse things to plant them in – and so many of my herbs are huge already! 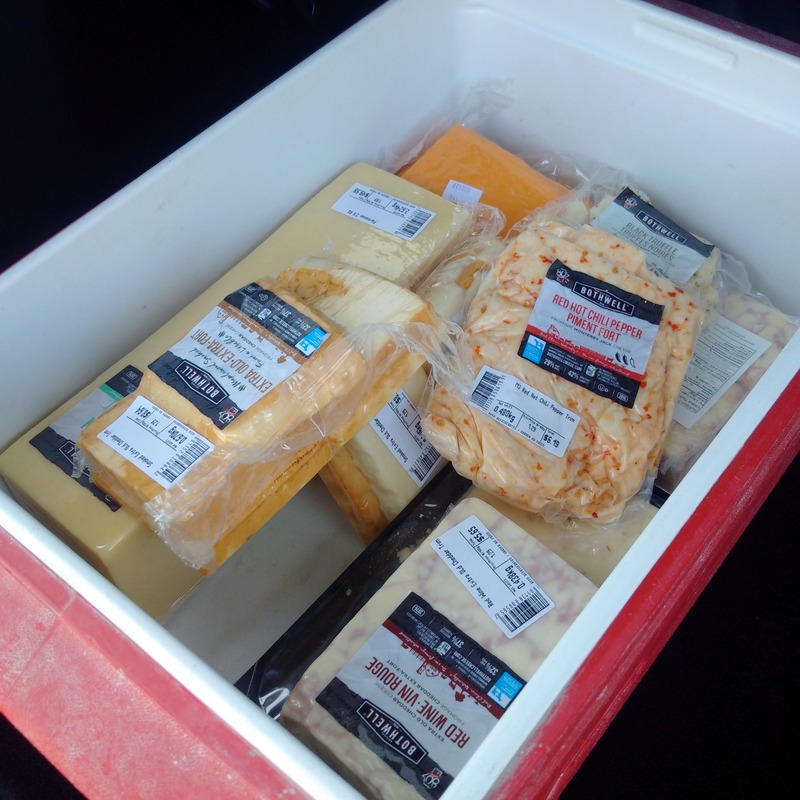 That was well worth picking up – little random errand, but it’ll pay off all summer long! We chose herbs that we all like, but that our guinea pig can eat too! We went to Winners and a few other stores that the kiddo loves to look around – she wanted a new purse and they have lots of great options there. Lots to choose from, and all her maybe’s were $30 or less which is great! Lots of mirrors too, to try them all on of course, to make the right choice! We got kiddo one of those little photo printers at Costco for her bday – so was happy to find a really cool way to display them at Winners. A frame with strings and little clips so you can show them all off. We went to Lasertopia to play some video games – they have so many games since the last time we had gone. Lots of huge old school games now and lots more opportunities to win tickets. Kiddo had been saving hers for quite a while, they’re just stored on a card. 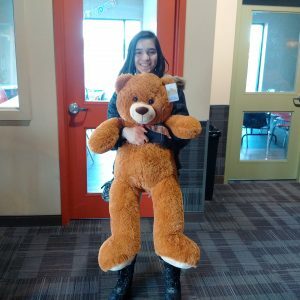 We played a bunch of games, and kept checking – kiddo wanted the hugest prize on the board, a huge teddy bear but it was 5000 tickets!!! Her $$$ amount on her card was dwindling and it wasn’t looking like it would happen this time – became a real nail biter! Well, she had amazing luck on a few games and was able to claim the bear! That was a blast and her smile was so huge and it was one of those moments we will always remember. 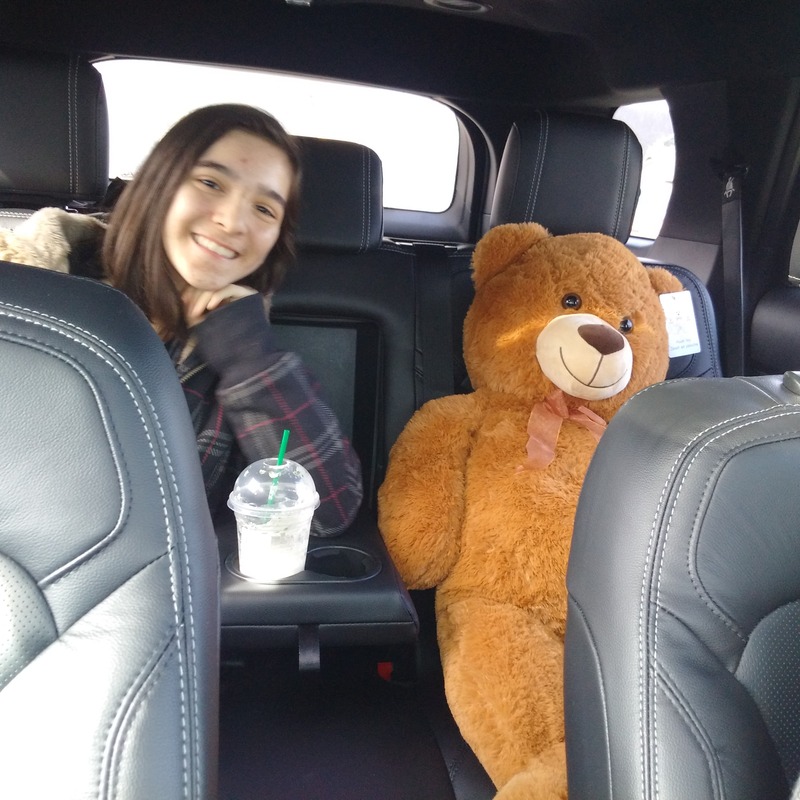 We had so much fun there, and she got to ride home with that giant bear next to her! 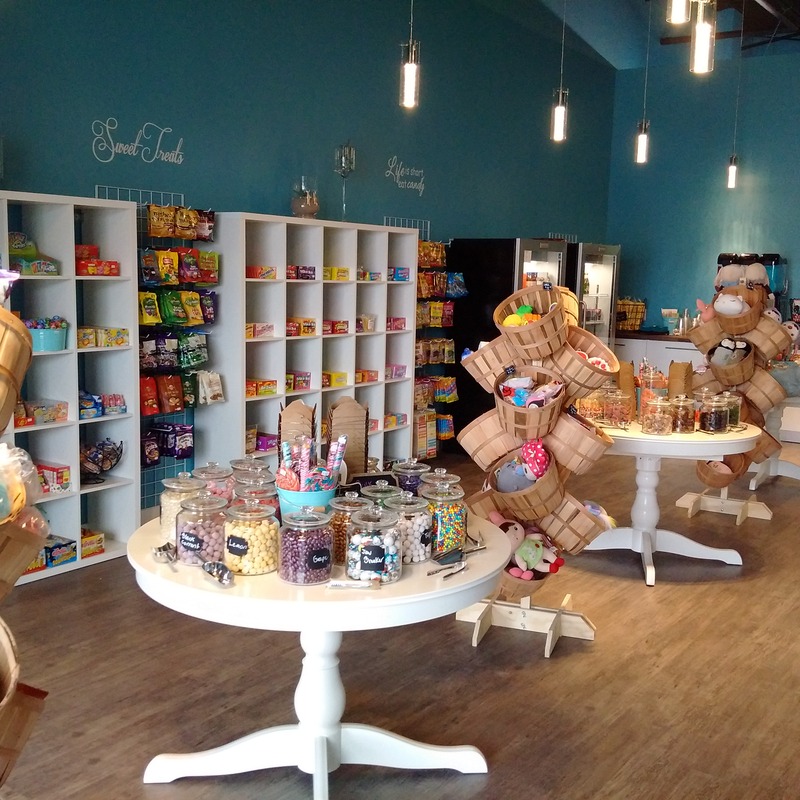 The next day we went to check out Sugar Beach, a new retro style candy store in Winnipeg! That was a lot of fun, and lots of neat old candies and lots we’d never seen before. If you need candy for a loot bag, birthday gift or if like us you’re doing a movie night, this is the place to go check out! We also went to Sweet C Bakery to get some birthday treats! Kiddo loves their Edible Raw Cookie dough – and this year she didn’t want a birthday cake so we just let her pick treats when we were out instead. And now they’re even starting to do milkshakes – so we will be heading there again soon too! Kiddo also took a class at Jacob’s Trading – she made this super cool memory wire bracelet with scented oil beads. It was fun and she learned a lot – and got to choose which scented oil she wanted for it. 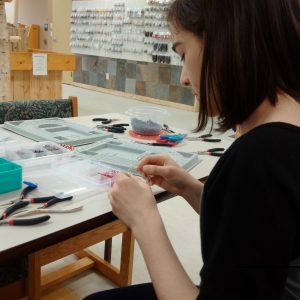 They offer all kinds of classes on Regent, we will be going back for more of those for sure! There’s also the full store there too, so after she made her bracelet she actually found a necklace there that really matched it too. As most people know, I go to Costco on Mondays – this was the perfect Costco trip vehicle! Lots of room for the family, and all kinds of random large sized Costco items! We had a lot of fun outings during the week, but I got all of my usual errands and everything done too, and driving it was a breeze! I have to say, my ultimate fave feature is the automatic lift gate – when you’re running errands that is priceless! Kiddo chose to go back to play the instruments that day too – we really did just drive back and forth across the city. But, when it’s your birthday week, you get to choose. Plus, this kiddo chooses some really fun activities! And I was glad the Explorer was great on gas too! Makes a big difference when you’re zipping all over the place and heading on the highway – that EcoBoost is great! Another fun place we went to check out was the Mint – they were advertising a million dollar coin. I thought we’d have to do a tour or something, but nope. 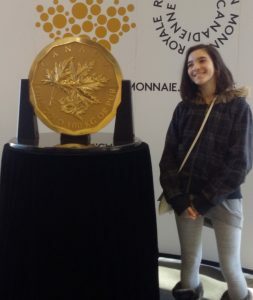 The coin was right in the gift store area – 2 guards with it though. You weren’t allowed to touch it but you could stand right next to it for a picture. Something really neat to see if you can! Right outside the mint there was the cutout of the coin for kids to put their face in too. And inside the mint there was a giant coin press – pay $3 and you can stamp out your own token (it’s not technically money, but looks like a quarter). Just a warning – the press is insanely loud!!! It’s not bad when you know it’s coming, but if you’re joking around and distracted like we were, it could really scare some younger kids. Just for an instant though, it’s great for a souvenir. The gift shop at the Mint had so many neat things for gift ideas – cards with coins for birthdays and things like that. 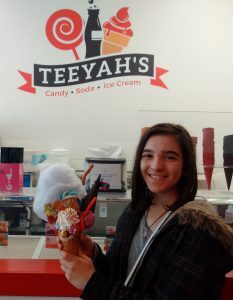 We took kiddo and a friend to the Mint, then to some of their favourite stores and ended the day with a trip to another one of our faves, Teeyah’s for some giant cones. They make special legendairy cones, and since it was kiddo’s birthday the next day, hers turned into the craziest cone ever! The first one actually crumbled and broke apart, it was so loaded with candy and treats! The amazing ladies there made her a new one and this one held up! These cones are a lot of fun to get, but it’s super messy so be prepared for that! They do give you a bowl and spoon, and I always pack a ziploc to store all the extra candies away for later. 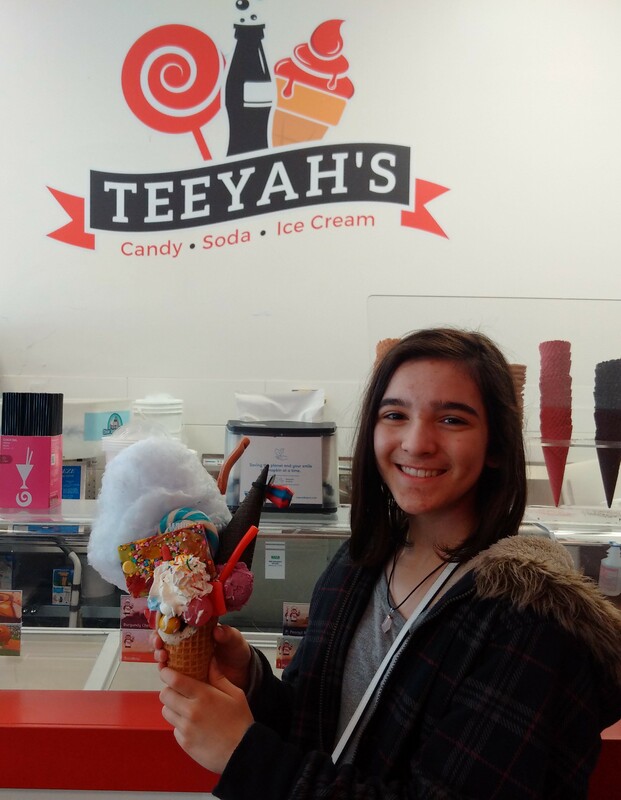 The girls loved their cones and it really makes a fun birthday outing! So this is where the week took a weird turn….kiddo came down with a bad cold and her birthday turned into a day on the couch and in bed. And the next day, and next day. So, I can really tell you that the Explorer is perfect for running out to grab Breathe Right strips, many many packs of Kleenex and all kinds of other cold essentials kiddo was requesting. We seemed to keep running out of everything. So, the week dragged on a bit, lots of naps and resting and by Saturday night she was finally good to leave the house. We picked up my brother and his kid to go see Ready Player One at the movies. Fun to have extra room in the SUV – and kids love sitting in that back row to goof around. I like how easy the seats go down too in that back row, if you don’t need them just leave them down. And one button and they pop right back up. I forgot to put them down one time when I was alone, and it’s a lot of headrests at the back when you don’t need them. Better to just pop them down. If you have more than one kid though, that last row is awesome! You can split them into seperate rows if you want which is really nice 🙂 And quiet. We still have a lot left on our list though, so I’m looking forward to checking all of those places out too! I’ll let you know when I do! And a huge thanks to Ford for the Explorer for the week to try out and a budget for some of our outings – as always the opinions are all mine. I’d say I’m an average driver, so when I can drive something and park it easily, I think that speaks well for it!